An entry for the #KrassJam 72 hours. Theme: A game where you mine ore from mythological places using science. Thanks for checking it out Riu! I would have loved to do camera controls. I agree fully. Happy to hear you had some fun with the concept. i did the same method as feefyefowfum. Although in addtion I set up A UGUI Canvas with another camera. Created a "rawImage UI Element" which I set to 256x256. (while the RenderTexture was set to 64x64 of course) Now you can have any size player. and the RenderTexture will always be displayed in the center of the screen at a size of 256x256 regardless of window size and/or ratio. 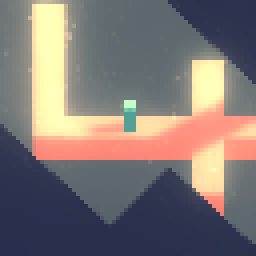 Still playing around with Rendering as I'm trying to come up with some gameplay ideas. Although I believe I might have something now. Playing around with some rendering options.